Tonight should be similar under mainly clear skies. The light offshore (easterly) wind flow overhead did push our afternoon temperatures into the comfortable mid 50s. I doubt we get frost at PDX tonight, nothing unusual since the average first frost is November 15th at that location. Each year is different with a first frost here in the city typically ranging from late October to sometime in December! Today is our 3rd dry day; looks like we’ll make it to 7 or 8 days before showers return later Tuesday or Wednesday. That’s a typical cold-season east wind event for our area; 6 millibars easterly flow through the Gorge Sunday ramps up to 9 millibars Monday. We’ll be in an inversion with that cool air flowing in from Eastern OR/WA near sea level. Up above, 850mb temps reach over +10 C. That much gradient squished down low under the inversion will easily give us gusts 55-70 mph in the western Gorge and 75-85 mph up at Crown Point for the first time this season. Have you been missing the wind since February? Well, the Monday holiday should deliver perfect conditions to reconnect your nostrils/eyeballs with that stinging cold wind. In this setup the east wind won’t make it very far into the metro area, mainly just east of I-5/I-205. But it’ll be enough to keep fog away Sunday-Tuesday. 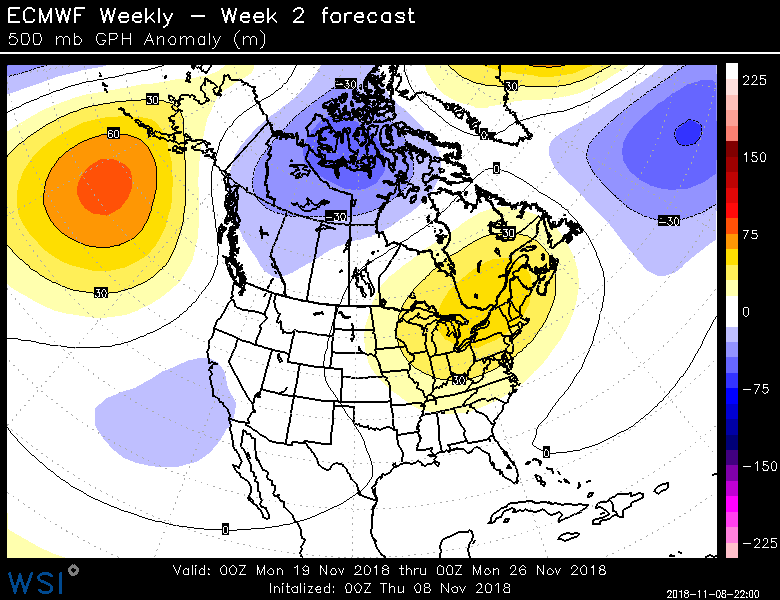 Easterly flow dies down later Tuesday through the end of next week as another weak system (like tomorrow’s) tries to crash the ridge party. That won’t give us much rain or mountain snow. Now beyond the 10 day period there are HINTS that we might see a change. The ECMWF 46 day run last night shows a bit cooler/wetter conditions for Thanksgiving Week. That’s because ridging seems to want to develop much farther offshore. I noticed the GEM model keeps the ridging overhead though. The result is low confidence right now beyond NEXT weekend. Interesting and definitely cool. But not a wet pattern. By the way, about two years ago I stopped showing these charts beyond the 2nd week. That’s after a great talk by Cliff Mass, pointing out how poorly the weekly forecasts had been doing. Beyond week #2 the accuracy definitely takes a nosedive! Enjoy the sunshine this weekend, and don’t bother raking your leaves if you live near/in the western Gorge. The wind should blow them westward and out of your yard by early next week. This entry was posted on Thursday, November 8th, 2018 at 7:29 pm and is filed under Weather. You can follow any responses to this entry through the RSS 2.0 feed. Both comments and pings are currently closed. The question is will it stay that way? The GFS is trying to bring in cooler air from the North and a low along with from BC around the 17th. But both the Euro and GFS show a real strong high pressure over the Rockies beforehand. We’ll see. One thing is for sure. Alaska and all the West is having really abnormal warm weather. Who put that out? That doesn’t even remotely come close to matching the official Australia BOM graph. FWIW, Australia BOM (Bureau of Meteorology) is the leading authority on all things ENSO. So, it rains for 9 months a year in Portland, right? Wrong. Here is a brief summary of our rain statistics since May 1st. It will be through 11/20 because we will likely be bone dry or close to it through then. That is 204 days. 6 2/3rds months. 39 days with measurable rain. 16 days with greater than .10’’ of rain. 7 days with greater than .25’’ of rain. Really puts things in perspective in my opinion. I vote that Oregon changes it’s name to Upper California. I know it’s been really dry but right now we really can’t do anything. One thing I am going to do is enjoy the weather we have right now. That is going up to Crown Point and feel the wind. The last post from Crown Point was a gust of 66mph at 12:56pm. We had a nice fake cold low of 25 this morning. Not too exciting but I will take it. 4th day in a row with a heavy frost and temps at 32 or well below in Aloha. NAM is showing a very intense East Wind event on Monday (50-60 widespread). GFS shows some 25-35 mph gusts in PDX and EURO shows 30-40 gusts. What an awful GFS run. I knew it was coming. At 6-7 days out, it seem to always do this. Great November weather here today and tomorrow; Mainly sunny skies, some nice westerly breezes. Yesterday’s high temperature was only 43F, so I can’t say it’s unusually mild anymore. The upcoming forecast for this time of year literally could not be worse in my opinion. We will get through 2/3rds of November with less than 1’’ of rain, no highs below 50, and a 0’’ base at Timberline. With El Niño strengthening and it’s full impact not generally felt until after the new year, I fear that this will be a historically feeble winter. 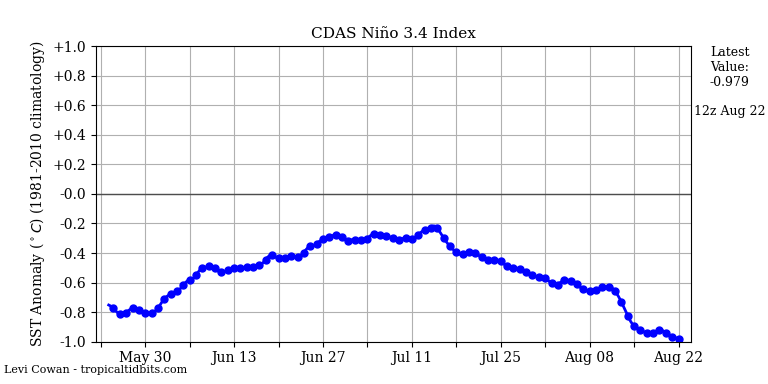 Actually El Niño is on a downward trend at this time from 1.5C. I think it will top out at +1.0C. We are near +.5C now I believe. Anyway, it will likely be a slightly weak/moderate El Niño when it’s all said and done. I thought El Niño was on a downward trend going into next year. At least that is what I got from the Weather Conference. I could be wrong. Joshua, I think you could be jumping the gun a little. Normally we see more cooler and wetter weather coming into the end of the month. The way the models have been trending, I think we could be turning a corner with us getting into a more active pattern. I wanted to say that for awhile but wanted to see if the models kept the trend. I know the 12Z GFS wasn’t good but that was one time. At least that is what I’m thinking. We’ll see. Ken, in all fairness, you’ve been eluding to this “turning the corner into a more active pattern” mantra since the last week of August. I’m fairly confident you’ll still be saying this into the last week of February, possibly into the middle of March. It’s a product of model riding that 10-Day wave. Everyone does it, and then they learn. Usually takes a couple of Winters before most recognize the pattern. Also, something else to take into consideration: The 06z and 18z are low resolution runs. They only aggregate half the data the 00z and 12z runs do, and the 06z sources its data from the previous day’s 18z run. For these reasons, those two runs are incredibly unreliable, and far inferior to the full resolution 00z and 12z runs, to be taken with a very large grain of salt. No disrespect intended, I’m just saying… all things to consider. I’ve said the same thing repeatedly over the past few years: We seem on the cusp of becoming UpperCA North. I lived in Fair Oaks, a Sacramento suburb prior to moving to Oregon, one of the main reasons being to FINALLY live in a place with real seasons. Some years have been, others not, including much of the last few which have been a mockery of the notion of “Real Oregon”——our 4 seasons here of late, much like those nearly every year in NorCal, being warm and dry, hot and dry, mainly dry but cooler, and alternately wet and dry. There have been some superb months such as the recent Dec (2016…I think) where it rained nearly every day. But more often of late it’s been rain in the forecast that somehow never shows up, or if it does a pathetic dribble. I was so looking forward to a wet November but with a total of .30” in the first 10 days and little more in the next 10, we’re right back to aridity, albeit at least (sorta) cold. This is becoming both boring and frustrating. Some have El Niño waning, others waxing, so who knows when, of if, any relief lies ahead. I believe that recent December you refer to was 2015. 2016 was snowy and cold for much of the duration. FWIW, ENSO 3.4 SST hasn’t been above +1.5C since March 2016. The (trails) were absolutely HORRIBLE. SOme were 3 at once and going in weird directions like SW to NW and some the other way. They were also doing the weird half circles and X patterns at the same time. The sun had the rainbow effect due to the particles in the air. Then at noon it all stopped as the REAL clouds took over and they look MUCH more beautiful then man made clouds. All this ABOVE commercial flight level (30,000) feet. Normal jet traffic…………………………:p Right. What about the days there ISN’T any chemtrails and no storms in sight? I guess all that normal jet traffic must’ve stopped…………………………. To you brainwashed folks doing this NO you will NEVER compete with God’s natural clouds. Whatever your projects are it isn’t going to work. Yeah, I know, those Lizard People again! They’ve got the Zodiac Killer making all of them fake clouds. Give me a break, troll elsewhere. 29F last night in Albany with frost. First real frost of the season. Had a light frost overnight, just a little bit of ice on top of my metal mailbox, and on the tips of the grass out front. Banana leaves didn’t wilt, so I harvested them all for a friend at work and brought them in to the office. Definetly a chill in the air today here(42 F current temperature) but no frost yet- just some light rain overnight. i like the long range forecast as well. First Fall frost here in E Portland, 30.6° this morning. I’m liking the trends the models are showing. If they can hold on with what they are showing we could finally start our rainy season. Also, it looks like we would have a very high chance that the mountains could get a decent amount of snow. That’s all if the models stay their course. I did take a look, hopefully things pan out for some fun weather! If you do rake your leaves, put them in your yard debris container! 29° @ my new home in Willamina Highlands with lots of frost. Thank you for the update Mark. I was wondering why you don’t show a 10 day outlook on air? I am looking forward to seeing the East Wind. I’ll be heading up to Crown Point to see how strong they really get since I was up there around the first of the year when the winds were around 100 mph. It was fun!!! I said on the last post about I wish we went by the CFS. It gave us a lot of windy weather plus cooler temps with a modified artic outbreak.